Continuing on in the Building Design & Construction Systems exam administered by NCARB, next we will discuss the Stair Layout vignette. 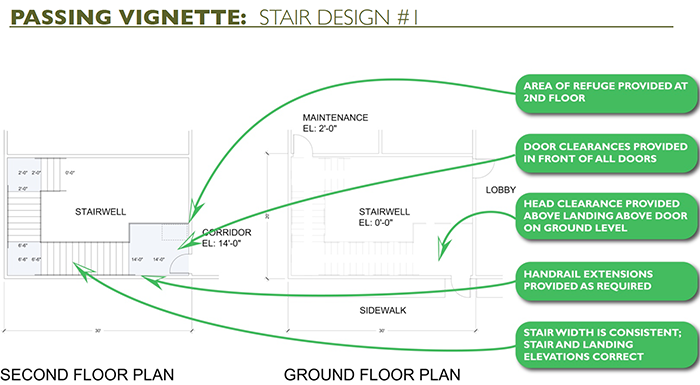 For this vignette, you will need to connect three levels in a building with a stair that meets the program requirements. 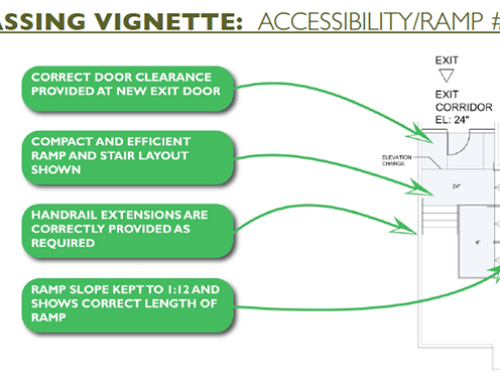 This vignette can be somewhat tricky, especially if you have never designed stairs before. However, just as with the other vignettes, spend some time practicing with the NCARB software and the vignette program to make sure you understand what this portion of the exam requires. 1. Follow the program. Bueller? Bueller?? If you’re paying attention so far, you should be expecting to see this as the number one tip. That is because, again, it is the number one most important thing to remember when studying for this and any of the ARE vignettes. 2. Connect the levels. Your stair layout will need to provide a clear path of egress from all the levels of the building down to the ground floor level. You will certainly have at least 2 levels to connect, however it is very likely you will need to also connect a third intermediate level as well, similar to what is shown in the NCARB practice software. Pay attention to what the program requires for the various components of the stair layout. 3. Follow the code. The program will provide you with a simplified building code which will dictate the necessary riser heights and tread depths required for the stair. Make sure your stair layout follows these precisely! One small mistake on a tread or riser size multiplied by the run of the full stair could be fatal. Check and double check your solution to make sure it complies. 4. Watch your head! Be mindful of any doors on the ground floor level – if your stair happens to pass above them, you will need to provide the proper head height clearance along the entire width of this door so that occupants can safely access the exit. Switching between levels while drawing your solution will help keep you aware of what is going on down below. 5. Provide an area of refuge. If the program requires an area of refuge on any of the building levels, make sure you provide the space on the landing directly outside the door on this level. This area will need to be kept clear from the access to both the door and the stair, so it should be placed off to the side. Also make sure to note any stair width requirements when an area of refuge is required. This stair width will need to be maintained throughout the entire length of the stair from that point forward, as stairs cannot reduce in width in the direction of egress travel. You will likely move on to this vignette after completing the Ramp Layout vignette, so you will have had a bit of practice and warm up using the stair, landing and handrail tools. The same tools will appear in this vignette and will be executed in the same way. The simpler and more straight forward your solution is, the better off you will do on this vignette. Try not to over-complicate the problem by trying to design a unique, interesting or aesthetically pleasing stair design. This is more like an emergency exit stair you would see off to the side of a building, one that is concealed in a rated shaft and would be designed only for function and safety. However, unlike a stair in a stair shaft, it may be a good idea to avoid the “winding” layout (where each level winds under the one above), as this would require you to use the Cut Stair tool… a tool that is not very well described on how to be used properly by NCARB and one I try to avoid using if possible. 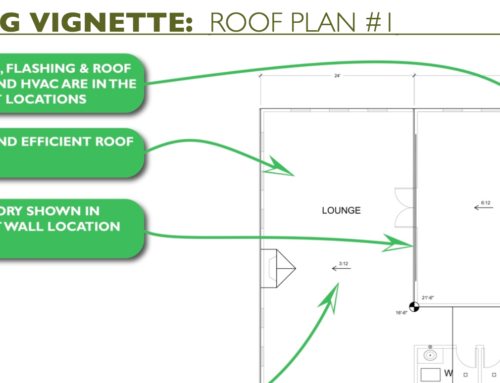 Stay simple and efficient and this vignette should be fairly easy to complete.